Formerly dropped by Lady Vox. Would use this all the time back in the day to bypass content. Rogue with this staff would pull mages corpse past all the mobs to a safe spot then mage would coth raid. Was fun. I have one on Cazic with 2 charges. Clickable while feigned. instant cast. Ive had it over 10 years. Its quite the nostalgia item but finally willing to part with it. Look me up! Looking to purchase one of these. Buying one of these on Cazic, paying plat - PM me or contact in-game. This item positively does not drop any longer. Anyone know if this still drops anywhere? It seems like people are saying it no longer drops but can anyone confirm? Selling one on Bertoxxulous 7 charges. Send in game tells or email to Kelina with serious offers, Thanks. Someone just offered 1 million plat to buy one of these things on Druzzil Ro 5 minutes ago. I'm searching for this staff on the Nameless server. If you have a fully charged staff in your possession, please contact me and we'll work something out. Offering 500k or more. I got one of these in march during a gm event in GD killing named elephants. anyone know how to recharge it? There's no legit way that I know of to recharge this item. :( Sorry. This definately no longer drops. ten charge limit was removed 2/20/05. Still has charges. None of them have unlimited charges. I take it you were just dreaming? He probably saw an Epic 1.0 Cleric. If limit on charges was removed is there a way to convert one with charges to new one without? killed Vox / Naggy for the last year, never dropped staff in 50ish kills. seen staff for sale 400k 10charge. I have been killing Naggy/Vox with my monk, I am hoping one will drop but its more or less just fun, if anyone could confirm it still dropping though that would rule. I have heard that it doesnt drop anymore and I havnt heard of one dropping in over a year. BTW Getting 3 rez sticks out of 8 spawns is just obsurd. 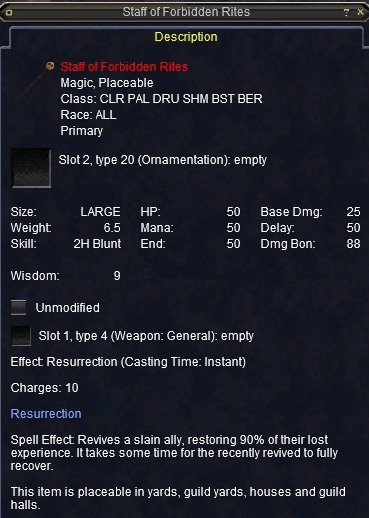 It does not drop off naggy and never has, im pretty sure if this dropped 3 times you would remember to which mob it dropped off of since it sells on most servers for 25k a rez. I payed 250k for the one I have now and it was fully charged. someone mentioned a quest in PoK to let ya recharge any item. anyone know anything about this? #vemanosbenji, Posted: Mar 26 2004 at 7:28 PM, Rating: Sub-Default, (Expand Post) Hehe i though that they wouldnt give it charges hehehe im makin SOE seem to nice! I mean how uber woudl it be if IIII as a BL coudl Rez for 90% shoot we deserve it but SOE doesnt give wahts deserved... heh! If this still drops, it ain't off of Vox. Tunare kills Vox every week, and the last one that dropped was Oct, 2002. This can no longer be recharged do to changes Verant has put in. #Raxxus, Posted: Oct 04 2003 at 7:40 PM, Rating: Sub-Default, (Expand Post) The Staff of Forbidden rites is an extreamly rare staff that CAN be recharged, but not be convetional means, seventh hammer in my opinion (10 differnt servers) has the most extream ammouts of uber stuff begind sold, there always a BoC, or SoD selling, this is one of the items that doesent sell. the way to recharge it (not defenately sure) is go to PoK, sell to someone, buy it back(500k!) sell it again, and buy it back again, for a total of one million Platinum, however on 7th hammer there are many a people who have a million platinuum so its not really a problem for them. staff of forbidden rites goes for an average price of 350k. it is officialy useless scence planes and 65, because its easier to level a cleric and get epic instead of even trying to obtain the cash, or the countless vox raids, even if u do drop one.... u still have about 20 people on a vox raid, thats a very odd change youl get it, and because the staff is useable from your inventory, everyone can have a roll. Wouldn't it just be easier to create a cleric... or hire one for that matter. yes it would, but this stick is used to drag a dead magician with a rogue to places you cant normally get to. Rogue drags mage, rogue rezzes mage, Mage starts COHing people to safe spot to set up for raid. Used to be done a lot in Chardok when you didnt have a mage with faction, also to get to POMischief before they moved the zone in.